In the heart of the Benbigh Moors, you'll find an oasis of tranquility: Llyn Brenig Reservoir and Visitor Centre, is set in 920 acres of moorland and forest, yet it's east ti get to - it's only 35 miles from Wrexham and 38 miles from Bangor. Whether sailing, fishing, walking or just relaxing, you'll find there really is something for everyone. 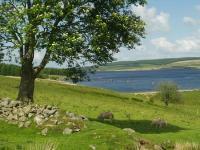 The Visitor Centre at Llyn Brenig has an interactive, walk-through exhibition of the reservoir and its rich history. There's also a superb video theatre featuring films about the construction of the reservoir and how it is used today. For the more energetic, there's a children's adventure playground, or if you prefer, you can take it easy and enjoy the panoramic views of Llyn Brenig from the lakeside Cafe, where you'll find a great choice of drinks, snacks and hot meals. There's also a shop, which has a wide range of locally crafted gifts and artefacts. There are a number of designated walks at Llyn Brenig, ranging from the 10 mile 'Round the lake' walk to the more leisurely 'themed trails' including an archaeological trail, where you can discover some of the secrets of the Bronze Age. Detailed guides of the walks are available from the visitor Centre. There are a number of picnic areas at Llyn Brenig, many of them set among the waterside conifers. In 1990, Llyn Brenig was selected as the only Welsh reservoir for use in the World Fly Fishing Championships and has continued to be a venue for international competitions ever since. It is still one of the few fisheries preserved exclusively for fly fishing for trout. Stocks of Rainbow Trout are added weekly and trout weighing over 10lb are frequently caught. The fishing season at Llyn Brenig runs from mid-March to the end of October. Every year parts of the forest are replanted and they include Norwegian Spruce trees which provide nutritious cones as food for the small, but increasing, number of Red Squirrels. There's also a bird hide, which offers a comfortable viewing spot, particularly for the groups of Teal and Goldeneye which arrive every winter in November. The wild heather on the slopes of Marial Gwyn is maintained to provide a natural habitat for both Black and Red Grouse. There is a dedicated educational ranger on hand to help arrange school visits to Llyn Brenig.